Frost or glaze these moist applesauce bars, or simply sprinkle with powdered sugar. The bars are flavored with vanilla and spices, and raisins and nuts provide crunch. Feel free to use Craisins (dried cranberries) or chopped dried fruit in the bars. 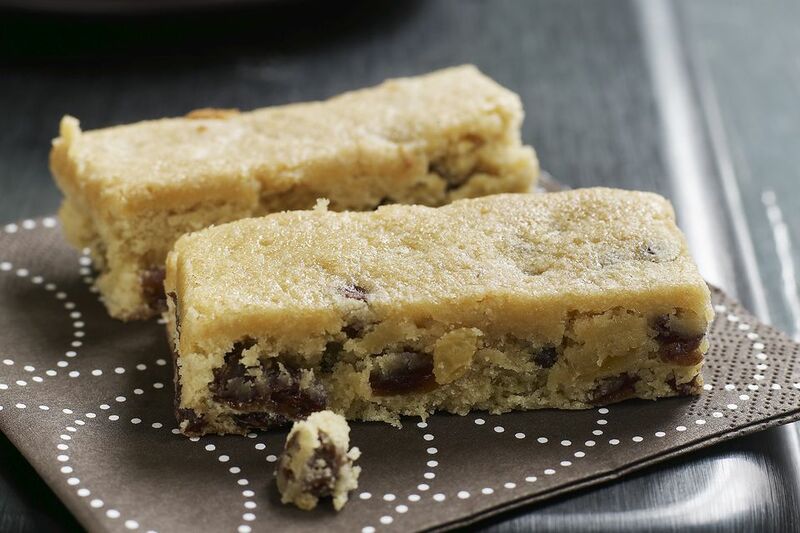 Toffee chips would be excellent in these bars as well, or make them with white chocolate chips. The bars are dusted with powdered sugar, or finish them with a simple vanilla glaze or icing. Heat the oven to 350 F. Grease and flour a 15-by-10-by-1-inch jelly roll pan or sheet cake pan. In a bowl or other container, mix the flour with baking soda, cinnamon, and nutmeg. In a large mixing bowl with an electric mixer, cream the butter with sugar until light and fluffy. Add eggs and vanilla; beat well. Stir the dry ingredients into the butter and egg mixture. Add applesauce, pecans and raisins and stir until blended. Pour into the prepared jelly roll pan. Bake in the preheated oven for 25 minutes, or until done. Cool applesauce bars on a rack and then cut​ into 2-1/2 x 1-inch bars and sprinkle with sifted powdered sugar.